Now , let's try some MCQ questions to understand this lesson better. What is in this video ? Notice that, this is the highest point on the graph. 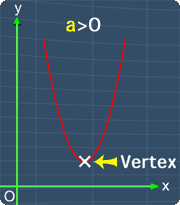 Hence, this point is the vertex of a quadratic equation..
Knowing this, we can substitute 'b', with -8, and substitute 'a', with 2. Now, we can simplify this term.ves you 3. Let's put this new value y = 3 into the table. Finally, we have x equals to 2. 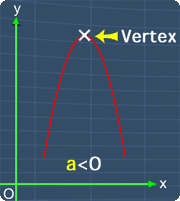 With this, we know that the vertex of the quadratic equation has the x-coordinate of 2..
Watch the video to find out where these plane are located. Visit the Q&A featuring categories such as Algebra, Graphs, Exponents and more. Also you can submit math question, share or give comments there. For visually friendly ways of understanding math, check out our Math Lessons. Once you’ve done that, commit your new knowledge to memory by proceeding on to our Homework Help section for exercises covering any math topic. Math Expressions also has a wide variety of Tools like apps and calculators to help you master the intricacies of this subject. Math doesn’t have to be complex at all when the basics are ingrained as friendly pictures in your mind! For tidbit on math & education in general sign up for MathExpress!